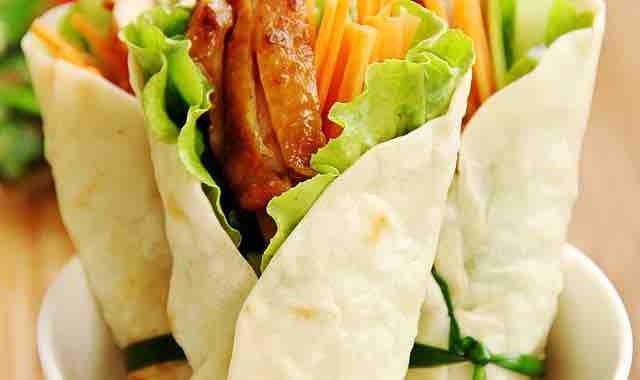 Chicken Lettuce Wrap is a traditional Chinese food, especially popular in Beijing, the Capital of China. People at all ages like it because it is very simple to make, very healthy and unique. It is a very good lunch box option for kids as well. I clearly remembered my mom always made this Chicken lettuce wrap for me while I was attending high school in China. We had many restaurants serving great Chinese food near my high school, but nothing could beat my Chicken Lettuce Wrap. We were in school for more than 12 hours per day at that time. It was an unforgettable experience—endless homework, long studying hours, high level of stress and competition. However, it was the best time at the same time because my resilience and strengths were greatly shaped by that period of time. Sorry, I was off track. Let’s get back to food, haha~ Emm, I am hungry~This recipe includes chicken and vegetables, which ensures a great balance of nutrition. You can also use some sauce according to your own taste, such as spicy sauce, soybean sauce or BBQ sauce. You name it! You will need a non-stick pan and some flour. In the traditional Chinese cooking method, we need to make the wrap by ourselves. But I understand we all live a very busy life nowadays, so feel free to buy the pre-cooked wraps from the Supermarkets, such as Target or Costco. Please follow steps below and create your own Chicken Lettuce Wrap! For more authentic Chinese Food Recipes, please visit chinesefoodsrecipe.com. 1. Prepare flour 70g and 30g starch. 2. Use warm water to mix the flour and starch. Make a dough and cover it by a cloth for 15 minutes. 3. Mix chicken breast with Oyster Sauce, Soy Sauce, Cooking Wine and Pepper Powder for 20 minutes. 4. Heat the pan with some cooking oil. Fry the seasoned chicken breast double-sided. Take out when it turns golden brown. 5. Cut the chicken breast, carrots, cucumber and green garlic into slices. 7. Roll the dough to a long strip. Cut the strip into small cubes. Use rolling pin to make thin round pieces. 8. Heat the wrap in a pre-heated pan. 9. Flip the side of the wrap once you see some bubbles. Wait until the bubbles turn brown, and then remove wraps from the pan. 10. Place the lettuce, chicken breast slices, carrots, cucumbers and green garlic prepared in step 5 on the top of the wrap. Add some spicy sauce. Roll the wrap and it’s ready to serve!! 1. If you buy pre-made wraps from supermarket, it will be easier so you can skip steps 1, 2, 7, 8 and 9. 2. If you don’t have chicken breast, you can use pork as well. Yzenith Chinese Foods Blog , where you can find Easy simply Chinese food Recipes.